The Valencia Coast Guard has confirmed that a fifth body has been discovered in the search for the missing fishermen. Candles are lit at a memorial on the pier at Union Hall. THE BODY OF a fifth fisherman lost following the sinking of a trawler off the coast of Cork in January has been discovered. The Valentia Coast Guard confirmed that a body was found today during a search for the last crewman Saied Ali Eldin in Glandore Harbour. The body is believed to be that of the Egyptian fisherman but no official identification has been carried out yet. Earlier this week, the body of skipper Michael Hayes was recovered from the bay. Authorities had scaled back operations last week – standard procedure after a three week search. 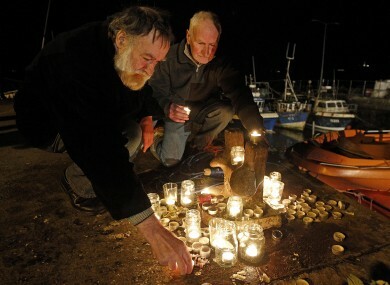 The trawler sank in the early hours of 15 January. One man – Egyptian Mohammed Add Elgwad – survived the tragedy. The bodies of his fellow crewmen Kevin Kershaw, Attia Shaban and Wael Mohammed were recovered in the days following the accident. All the men that were aboard the vessel have now been accounted for. Dozens of volunteers had joined the search for the missing fishermen, while other locals rallied to provide food, comfort and other assistance to the family members who gathered at the Union Hall pier over the past three weeks. Email “Final body found in search for lost fishermen off Cork coast ”. Feedback on “Final body found in search for lost fishermen off Cork coast ”.